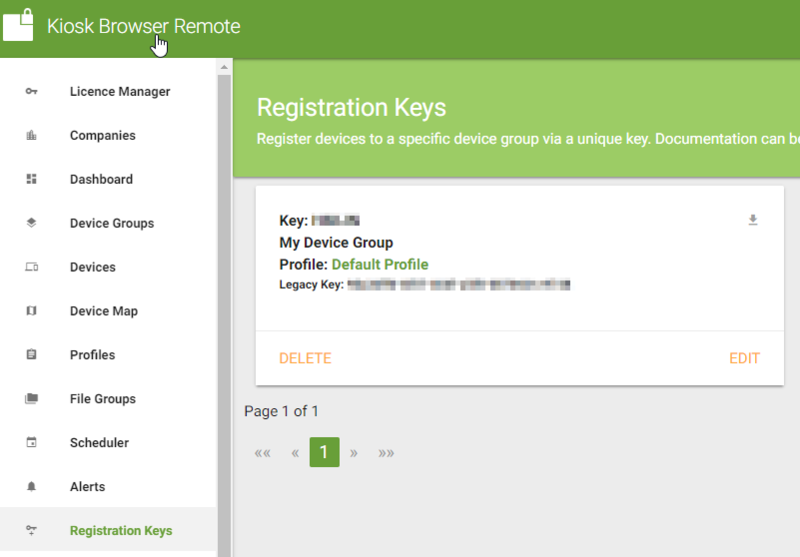 Using registration keys it is possible to register a large number of devices to different device groups as well as avoiding giving anyone the master registration key. There are two types of registration keys. Long Key: 24 characters i.e. xxxxxxxx-xxxx-xxxx-xxxx-xxxxxxxxxxxx This is a legacy registration key and can still be used in all scenarios. How do registration keys work? Let&apos;s say you want to roll out 100 devices, 50 devices to "Device Group Onsite" and 50 to "Device Group Offsite". You would create 2 registration keys via the management console and assign "Device Group Onsite" to key 1 and "Device Group Offsite" to key 2. Once registered using one of the options below these devices automatically make themselves members of the relevant device group and download the correct profile settings. Provision your device(s) using our provisioning app (the simplest and most secure method) . See Provisioning Devices for more information. The most flexible method to register devices, simply copy the file kbremote.xml to the default storage area (home/root), this file contains the relevant registration key. Then install Kiosk Browser either via APK or through Google Play. Once launched Kiosk Browser will automatically register the device using the registration key found in kbremote.xml. You can download the XML file using the download icon. Setting the delete value to "true" means the xml file will be deleted after the key is imported. We provide you with a custom APK, once installed and launched Kiosk Browser will automatically register the device using the registration key embedded within the APK. This makes a lot of sense if you are less worried by the default device group but want to make registration simple. Note costs are associated with this method, see here for more information on branded versions.